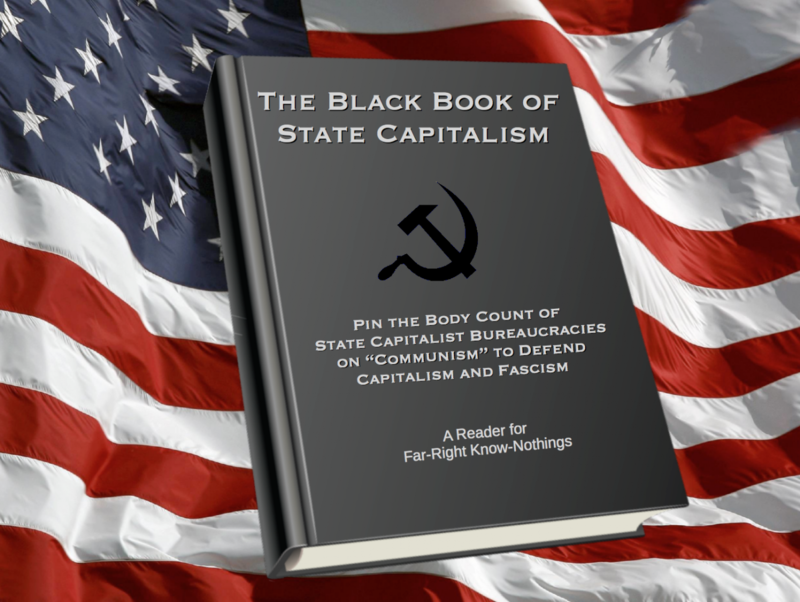 Anyone who has ever argued in person or online with Republican, alt-right, fascist, white nationalist, or the myriad overlapping identities of the Right today will recognize a few standard ahistorical moves they use to “win debates.” One is to bring out the “Black Book of Communism” whereby the body counts of state-capitalist, Stalinist, and Maoist, regimes are held up to show that “communism” has killed elevendy jillion people while capitalism has saved an equal amount, and simultaneously spread freedom, democracy, and wealth. The intent is never really to criticize these (state capitalist) regimes, but to prove capitalism is the only possible system a sane person would choose. A supporting argument notes that “capitalism is human nature” so stop pretending anyone who was not brainwashed by cultural Marxists at the University has a legitimate gripe with it. The vast majority of the people defending capitalism as freedom cannot tell you how capitalism works. Especially popular these days are what I think of as the “mirror world” arguments. In our world we know capitalism is a system in which a ruling/owning class expropriates the surplus value of the labor power of the working class. Capitalism is a redistribution of value and wealth upward to a small dominating class. In mirror world, genius entrepreneurs and business people are “creatives,” “job creators” and “risk takers” whose “work” creates all wealth. The rest of us benefit from the hard work of this “John Galt” class. If you work hard you can be a boss someday, or a useful person like Kylie Jenner or Steve Jobs. Socialists “spend other people’s money” so they can drive the economy into the ground by giving out free stuff no one earned. It’s the people in urban areas, illegal immigrants, spoiled college students, feminists, and intellectuals who contribute nothing to society who get in the way of the normal functioning of such a perfect system. Coming back to the subject of fascism, today the mirror world arguments depict antifa as violent thugs attacking peaceful marchers who only wanted to celebrate free speech. Antifa, or anyone in the street confronting white-nationalist wildings are the “real fascists.” Stormfronters, KKK, American Guard, Sons of Odin, Proud Boys, Rise Above Movement, White Aryan Resistance, Identity Evropa, Patriot Prayer and other groups who, together, mobilize fighting units to attack cities, terrorize and beat leftists, and demonize immigrants while calling for their deaths, are the Enlightened pro-democracy forces pushing against censorship and for civility. And aren’t the Proud Boys multi-ethnic, thereby proving they can’t be fascists? Never mind that Imperial Japan’s leaders were fascist, or that today’s Hindutva nationalists in India are fascists. Proud Boy Tiny Toese is Samoan! Who cares that he wears a “Pinochet Did Nothing Wrong” shirt? The “Right Wing Death Squad” line of clothing, is of course also not fascist in any way. “Pinochet killed zero people because communists aren’t people” is the Proud Boy line. If you see interviews with Proud Boy fighters, they usually portray themselves as under attack by hysterical communists, with themselves in the familiar Chris Kyle (“American Sniper") role of the “sheep dog” fighting off the wolves to protect the herd (good, normal, Americans). One of the most popular mirror world arguments posits that fascism has always been a leftist movement, anti-capitalist, and even socialist. These arguments often cite Nazi rhetoric used to appeal to the working class in the 1930s (and Trump also appeals to them today) from speeches on “the workers” or against bankers. They also like to bring up that Mussolini was a socialist (but leave out the part where he rejected socialism for nationalism) as evidence that fascism has always been socialist. So I thought it might be useful just to post what a couple of historical scholars of fascism have to say about whether fascism is either anti-capitalist or socialist. I don’t expect people on the far right to be persuaded by historically grounded arguments, but with such grounded sources, those on the left can better define our own goals in opposition to fascism and its progenitor, capitalism. Another supposed essential character of fascism is its anticapitalist, antibourgeois animus. Early fascist movements flaunted their contempt for bourgeois values and for those who wanted only “to earn money, money, filthy money." They attacked “international finance capitalism" almost as loudly as they attacked socialists. They even promised to expropriate department-store owners in favor of patriotic artisans, and large landowners in favor of peasants. Whenever fascist parties acquired power, however, they did nothing to carry out these anticapitalist threats. By contrast, they enforced with the utmost violence and thoroughness their threats against socialism. Street fights over turf with young communists were among their most powerful propaganda images. Once in power, fascist regimes banned strikes, dissolved independent labor unions, lowered wage earners’ purchasing power, and showered money on armaments industries, to the immense satisfaction of employers. Faced with these conflicts between words and actions concerning capitalism, scholars have drawn opposite conclusions. Some, taking the words literally, consider fascism a form of radical anticapitalism. Others, and not only Marxists, take the diametrically opposite position that fascists came to the aid of capitalism in trouble, and propped up by emergency means the existing system of property distribution and social hierarchy. The emphasis has, therefore, been far more heavily laid upon the essential continuities in the class structure of Nazi Germany, rather than upon incisive changes. Schoenbaum himself had accepted that the social position of the elites remained relatively unscathed down to the last phase of the war. He may, however, have rather exaggerated the extent of the fluidity in social structures and the amount of upward mobility which took place. Of course, it is true that thrusting, energetic, ruthless, and often highly efficient ‘technocrats of power’ such as Heydrich or Speer pushed their way to the top. And the war certainly accelerated changes in the high ranks of the Wehrmacht. But the new political elite co-existed and merged with the old elites rather than supplanting them. Non-Party preserves such as big business, the civil service, and the army recruited their leadership for the most part from the same social strata as before 1933. Education remained overwhelmingly dominated by the middle and upper classes. The most important and powerful Party affiliation, the SS, recruited heavily from the elite sectors of society. If the traditional ruling class had to make some room for social upstarts from lower ranks of society who had gained advancement through positions of power and political influence, such changes amounted to little more than a slight acceleration of changes already perceptible in the Weimar Republic. At the other end of the social scale, the working class-- deprived of a political voice, its social gains of the Weimar Republic reversed, and exposed in the shadow of mass unemployment to the brutal exploitation of employers backed by the repressive apparatus of the police state-- had its living standard reduced in the first years of the Third Reich even from the lowly level of the depression era. The slight rise in real wages in the later 1930s was a by-product of the armaments boom, and was accompanied by intensified pressure-- physical and mental-- upon the industrial workforce. The class position of workers remained basically unchanged into the middle of the war-- except that the most extreme exploitation now fell upon foreign workers. Whenever fascist parties acquired power, however, they did nothing to carry out these anticapitalist threats. By contrast, they enforced with the utmost violence and thoroughness their threats against socialism. A very partial list of deaths caused by capitalism. It's more than ever in vogue to go to the "Black Book of Communism" and whip out ahistorical decontextualized statistics and body counts for "communism." It's not that I have any desire to defend Mao, Stalin, Pol Pot or others, but that in historical context we can't come to the conclusion that the "antidote" to tyranny and death is capitalism, a system completely intertwined with those deaths and many many more. Just a very partial tip of the iceberg listing of some capitalist caused deaths. I'll leave off the roughly 9 million people who die of hunger every year in the capitalist global system, an obviously failed system. First, neither Stalin's Russia, nor Mao's China were communist. If you define communism as workers control over production, abolition of wages as a tool of the owning class extracting the value of workers, abolition of classes, and of markets, obviously we haven’t seen a communist society yet, except in brief moments like Paris 1871, Spain 1936, and a few others. So your totals from State capitalist regimes are sad and horrifying but have little to do with communism. What we have in the Soviet Union for example was a state bureaucracy functioning as a ruling class, extracting value from labor of a working class inside a hideous totalitarian gulag/police state. That was state capitalism, and now Russia is just extreme western style capitalism with more open gangsterism and state control overlaid. The revolutionaries were successful in crushing the repressive monarchy of the Tsar, but the Bolsheviks then took over the revolution and ushered in a one party state capitalist regime with Stalin as the final symbol of defeat. Mao’s “Cultural Revolution was neither cultural nor a revolution and you can read Simon Leys, the foremost critic of Maoism to see that Mao ruthlessly crushed communist formations inside China as he attempted to industrialize the country to compete with capitalist powers. There are other important totals to look at as well. Mike Davis has written about “Late Victorian Holocausts,” with the example of the British Raj killing 30 million Indians from the mid 19th century to 1900. This was due to the destruction of traditional systems of emergency distribution that existed under the Mughals. Production had been forced into mono-crops, and exported to ports for the world market via British built rail systems. The British ruling class saw the mass famine as “Darwinian winnowing” of a subhuman species. A bit earlier, the British capitalists had killed a million Irish in a potato famine, even though there was more than enough food being produced to feed them and millions more. It had to be shipped out to markets for profit though, so it was ok just to let them die. David Stannard and countless other historians put the Native American genocide at around 100 million. If we look at other scholars estimates of non-disease related deaths they go down to about 15 million in “democide”, mostly in Latin America a great center of capitalist encomienda production by the first major capitalist colonial power, Spain, and also Portugal. At least 2 million black slaves were killed directly in the Atlantic middle passage of the early emerging capitalist economy, but the devastation created inside Africa, as is well known, destabilized much of that continent down to the present day. Hard to calculate the suffering or body count there. Adam Hoschild’s King Leopold’s Ghost showed 10 million Congolese killed in his “Free State of Congo” to supply rubber to the west for bicycle tires. World War 1, was as is not in dispute, a war between imperialist powers to control colonies, labor, resource, trade routes, etc. 41 million casualties and of those, 18 million were deaths. World War II, the continuation and settling of that war saw 70 to 85 million. World War 2 would never have happened were it not for the capitalist Great Depression which saw the rise of the previously disappearing Nazi Party in Germany, which started the war under Hitler, in a series of invasions that brought another total war with the reaction to the invasion of Poland. It was mostly between belligerent capitalist empires as was World War I. All of the empires had already racked up millions of corpses, and sadly, the fascists were not exceptional in that regard. But there's no question that fascism is a defense of the capitalist state, and that it's main enemy was "communism." Fascists crushed workers unions and brought them under control of the party and capitalist state. The US invasion of Vietnam, Laos, and Cambodia, killed roughly 3 million, mostly from illegal secret bombings. The resulting destruction of civil society in Cambodia led directly to the rise of the Khmer Rouge. Unless you think those things are somehow unrelated? The US led UN Security Council sanctions against Iraq killed one million including 575,000 children, according to Unicef. The 2003 invasion has since created about a million more “excess deaths,” according to the British Medical Journal the Lancet and many other studies. About 250,000 Filipinos died in the war of American invasion of 1899-1902. Renowned economist Amartya Sen’s research concluded that about 100 million “extra deaths” resulted since the implementation of the “capitalist experiment” in India in 1947 up to 1979. They really stick to those talking points! A young woman courageously stands up to some College Republicans and they unleash both the "Nazis were socialists, it's in the name" and the "Socialists have a way higher body count" canards. She dispatches their asses to hell, despite their teaming up on her and relentlessly pushing her buttons. Well done sister!